Thomas Allen (1536-1632), the most learned astrologer and mathematician of his time, was at Trinity College, becoming a fellow in 1565, but later migrated to Gloucester Hall, the forerunner of Worcester College, for 62 years. Elizabeth I consulted him about a nova in Cassiopeia. He saved many 14th century MSS by Bradwardine and others which Merton was throwing out. Portrait in the Bodleian [Gunther]; [Heyworth]; [Poole] and in Trinity College. There is an Aristotle Lane in the northwest of Oxford, leading to a trading estate and to Port Meadow. Elias Ashmole (1617-1692) spent 1645-1646 at Oxford and became a member of Brasenose College and studied natural philosophy, mathematics, astronomy and astrology. He was a founder member of the Royal Society. He later obtained the Tradescants' collections and gave them to found the Ashmolean Museum in 1683. Michael Atiyah was Reader (1961-1963), then Savilian Professor of Geometry (1963-1969), then Royal Society Research Professor and Fellow of St Catherine's in 1972-1990. Roger Bacon (1214-1294 (or 1292)) studied at Oxford, pursuing Greek at the suggestion of Grosseteste. After some time at Paris, he returned to Oxford in 1250-c1267, but retired from an active part in university life in 1257. After a period in Paris, apparently including 14 years in confinement, he returned to Oxford in 1292 and died there. He is said to have built an astronomical tower on the bridge over the Thames (= Isis). This became known as the Folly or Friar Bacon's Study and the bridge is still called Folly Bridge even though the tower was torn down in 1779. The present tower dates from 1849. [Baverstock] [Heyworth]. [Huxley] gives a drawing of the tower in the 18th century. [Gunther & Simcock] is a picture of an eighteenth-century painting in the Museum of the History of Science showing the tower. [Headlam] and other sources relate that tradition says Bacon used the story over the gateway of the bridge and that a Mr Welcome later leased it and added a story, which became known as Welcome's Folly, hence the name of the bridge. Bacon is said to have made astronomical studies from the church tower in Sunningdale, some miles south of Oxford. There is a model of the thirteenth century church showing Bacon on the tower with an astrolabe. 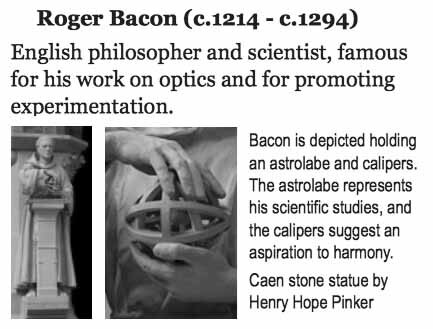 Bacon gives a reasonably clear description of the telescope and microscope, but there is no physical evidence for these and the description doesn't clearly indicate that he had made these. He gives a recipe for a rather feeble gunpowder, certainly not original with him, but he did suggest enclosing it to increase the effect. He anticipating circumnavigating the globe and suggested calendar reform. He lived in the Franciscan House in Oxford, now built over by the Westgate Centre and its car park in Paradise Street, in 1250? - 1257?. There is a plaque high up, behind some trees, on the south wall of the Westgate Centre, just to the east of the facing carpark [Huxley]; thanks to Eddie Mizzi for a photo; [Headlam] seems a bit dubious about the site. He is thought to have died in Oxford and to be buried in the Franciscan burial ground of Grey Friars church. [Eagle & Carnell]; [Holmyard] He is sometimes said to have been at Merton or Brasenose, but neither college was in existence at the time. A statue of Bacon, holding an armillary sphere, was added to the statues in the court of the University Museum in 1914. John Bainbridge (1582-1643), was at Emmanuel College. He was the first Savilian Professor of Astronomy in 1629-1642, He is buried in Merton Chapel - Eddie Mizzi has sent a photo of the gravestone. He constructed a sundial on a buttress of the Chapel. Portrait in the Bodleian. [Gunther]. [Poole], [Huxley], and a postcard of it, provided by Eddie Mizzi, say the sundial may be due to Briggs. Jeremy Bentham was a student at Queen's in 1760. Tim Berners-Lee was a student of physics, graduating in 1976. Henry Billingsley is reputed to have studied at Oxford with an Augustinian friar named Whytehead before migrating to Cambridge [Gunther]; [Ball]. Thomas Bodley (1545-1613), of the Bodleian, was a student at Magdalen College, later a fellow of Merton. He is buried in Merton Chapel (or Antechapel), where there is wall monument with figures of Arithmetic, etc. [Piper]; [Huxley] There are two busts and three portraits in the Bodleian [Headlam]; [Poole]. 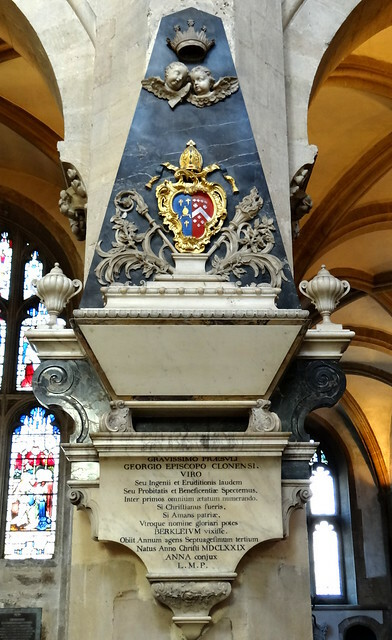 Edward de Bono came to Oxford on a Rhodes Scholarship and entered Christ Church. He did his first degree in psychology and physiology, then a DPhil in medicine. Robert Boyle (1627-1691) settled in Oxford in 1654. Then or a bit later, he took lodgings with a leading apothecary, John Cross, at his house Deep Hall in the High Street. He stayed there until 1668, carrying out his experiments, using Cross's laboratory. He and Peter Sthael lectured on Chemistry at the Ram Inn, 113 High Street - John Locke attended [Headlam]. The 1654 air pump experiments of Boyle and Hooke are commemorated by a plaque on University College, where the Shelley Memorial is on the site of the house or laboratory. Other sources say the laboratory site is now part of the Fellows' Garden. Boyle's The Sceptical Chymist, 1661, is considered the beginning of chemistry - in this he elucidates the idea of an element and defines acid and alkali. In 1661, he discovered that heating wood gave off condensable vapours and found a liquid similar to alcohol, but not the same, which was called 'wood alcohol'. Boyle and Hooke discovered Boyle's law, c1654, but it was not published until 1662 in the second edition of On the Spring and Weight of Air. The air-pump is commemorated in a southern constellation - Machina Pneumatica or Air Pump [Gunther]. ([Sobel] reports that constellations of Telescopium, Microscopium, Sextans and Horologium also exist.) In 1663, he described the colours of soap bubbles. Many of the meetings of the Oxford precursor of the Royal Society were held at Boyle's rooms. Boyle moved to London in 1668. C. V. Boys worked in the Clarendon Physical Laboratory c1900 [Gunther]. James Bradley (1693-1762) was at Balliol from 1711, BA in 1714, MA in 1717, studying under Keill. FRS 1718. In 1723, he computed the orbit of a comet for Halley. He succeeded Keill as Savilian Professor of Astronomy (1721-1764). He discovered the aberration of light in 1725 and verified the nutation of the earth's axis in 1748. At first, he only came to Oxford to give his Savilian lectures, but in 1732 he moved to Stable Hall, 7 New College Lane. He regularly lectured on experimental philosophy from 1729 until 1760. After his appointment as Astronomer Royal in 1742, he moved to London and spent little time in Oxford though he was the first Reader in Experimental Philosophy from 1749 [Simcock]. DD in 1742. Portrait in the Bodleian. 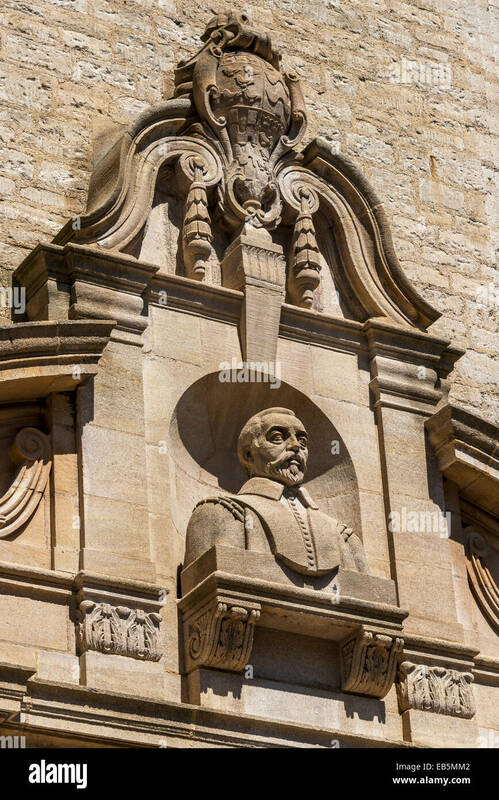 Henry Briggs (1561-1630), first Gresham Professor of Geometry (1596 1620), then first Savilian Professor of Geometry at Oxford (1620-1630), is buried in Merton College Antechapel [Gunther]. He has a floor slab in the middle of the north floor with the simple inscription 'Henricus Briggius' [Gunther]. William Brouncker (c1620-1684) came to Oxford with Charles II in 1642 and took up mathematics. Doctor of Medicine in 1646/7. He introduced continued fractions in 1657-1658 and may have been the first to give a series for log x. He was first President of the Royal Society. [Gunther] [Piper] refers to a monument to him in Christchurch Cathedral, but this is to his father, also William, and mother [DNB]. Mary Lucy Cartwright (1900-1998) was a student at St Hugh's, graduating in 1924 (or 1923). After four year's teaching, she returned to do a PhD under G H Hardy in 1930. Lewis "litell Lowis" Chaucer was sent at age ten by his father Geoffrey to study the astrolabe at Oxford, leading to the father composing an English treatise on the astrolabe - the first scientific work in English and the standard English treatise on the device for over 500 years [Gunther] and also [Gunther]. Merton College's Old Library has an astrolabe said to have been used by Geoffrey Chaucer [Yurdan]. The Bodleian has two portraits of Geoffrey [Poole]. John Colson (1680-1760) was a student at Christ Church, but left without taking a degree. He was later Lucasian Professor at Cambridge. John Dee has a portrait of in the Ashmolean, just outside the Tradescant Room [Huxley]. Lord Denning, the judge, got a double first in mathematics and a first in law [Roger]. John Theophilius Desaguliers (1683-1744) taught pioneering experimental philosophy classes at Hart Hall (now Hertford College) in 1710-1712 [Simcock]. Leonard Digges (? ?-c1570) was at University College. Following Bacon, he made a telescope before 1570, perhaps c1550. He also invented the theodolite. His son Thomas described the telescope and theodolite in 1571 and 1579. Part of this description seems like a Newtonian reflecting telescope. [Gunther]; [Gunther] [Turner] says the description of the theodolite was published in 1556. Carroll bought a set of fireplace tiles by William De Morgan (son of Augustus). He was mathematical lecturer in 1855-1881. Though ordained deacon in 1861, he never became a priest, but he occasionally preached, e.g. at St Mary the Virgin in the High Street and in Guildford. Christ Church has much memorabilia of him in the Chapter House, including the Burne-Jones cartoon for the Edith Liddell memorial window [Heyworth]. There is a portrait of Dodgson in the Great Hall, though this was posthumous [Piper]. Alice Pleasance Liddell (1852-1934) was the second oldest of the three daughters of H.C. Liddell, Dean of Christ Church from 1855, who went on the boat ride with Carroll and his friend Robinson Duckworth on 4 July 1863. Christ Church Cathedral contains a memorial window to the youngest daughter Edith (the 'eaglet' in Alice), who died of peritonitis a few days after her engagement in 1876, aged 22. She and her parents are buried in a family vault beyond the window. There is a portrait of Dean Liddell in the Great Hall and a statue of him over Wolsey's Gateway. The window above the left fireplace of the Great Hall shows Alice, Carroll and Wonderland characters [Manley]. See [Bagley]; [Manley] for the numerous Carrollian associations in Oxford. Carroll gave his talk 'Where does the day begin?' to the Ashmolean Society. His pocket watch is in the Museum of Oxford in St Aldate's. Alice's Shop, 83 St Aldate's, was the model for Tenniel's illustration and now specializes in Alice souvenirs. Francis Ysidro Edgeworth (1845-1926) was a student after graduating from Trinity College Dublin. He was Professor of Political Economy in 1891-1922 [Bailey]. Einstein stayed at Christ Church for several summers c1930 [Whitrow]. St Catherine's College has a bronze cast of Epstein's 1932 bust of Einstein near the bell tower [Piper]. Erasmus came to Oxford in 1498 and learned Greek. He stayed in St Mary's College, a defunct institution, a few remains of which were visible in Frewen Hall, on the East side of New Inn Hall Street, in the early 20th century. [Headlam] Three portraits in the Bodleian [Poole]. John Florio was a Fellow of Magdalen in 1583 when he was visited by Giordano Bruno (qv above). This was the first advocacy of the Copernican theory in England. Leslie Fox (1918-1992) was at Christ Church from 1936, continuing to a DPhil. After some years with the Admiralty computing Service and the National Physical Laboratory, he was appointed to set up the Computing Laboratory at Oxford in 1957. Professor of Numerical analysis and fellow of Balliol from 1963 until his retirement in 1983. Henry Gellibrand was at Trinity and built a dial over the library [Gunther]. William Ewart Gladstone (1809-1898) got a double first in mathematics and classics, but went into politics, becoming an MP in 1832. Jonathan Goddard (c1617-1675) was Warden of Merton in 1651-1660. He is said to have made the first telescope in Oxford [Gunther]. W. S. Gosset ("Student") was a student at New College [Sandon]. Margaret Gowing (1921-1998), the historian of the UK atomic bomb project, became the first Professor of the History of Science at Oxford in 1973. She was both FBA and FRS, a joint honour which only Karl Popper also had. John Greaves was Savilian Professor of Astronomy from 1643 and sub-warden of Merton. David Gregory (1659(1661? )-1708) was at Balliol. He was Savilian Professor of Astronomy from 1691 to the time of his death in Maidenhead. He has a monument on the south side in St Mary the Virgin, High Street - I have a photo. [Lawrence] His Catoptrice et Dioptrice Sphaericae Elementa of 1695 gives the first idea of an achromatic combination of lenses - he may have had this idea from Newton. Robert Grosseteste (1168?-1253), philosopher and scientist, was the first (or one of the first??) Chancellor of Oxford University. He then was Bishop of Lincoln, in 1235-1253, but at that time Oxford was part of the See of Lincoln so he continued his Oxford connections. Boole studied a memoir of Grosseteste's in the British Museum and said that he had come close to the Principle of Least Action [MacHale]. Edmund Gunter was at Christ Church. Savile interviewed him for the first Savilian Professorship of Geometry but found him too advanced and sent for Briggs instead. G.H. Hardy was a Fellow of New College during his Savilian Professorship, 1919-1931. The College amended its by-laws to allow Hardy to vote for the Warden without entering the Chapel. He was the original proposer of a mathematical institute which was established many years later. Thomas Harriot (1560 1621) was born in Oxford and was a student at St Mary's Hall, since merged with Oriel [Gunther], graduating in 1580. Stephen Hawking was an undergraduate at University College, 1959-1962. Percy John Heawood (1861-1955) was a student at Exeter College. He remained at Oxford until 1887 [Biggs. Lloyd and Wilson]. William Higgins, who discovered the Law of Multiple Proportions in 1788, 19 years before Dalton, was a student at Pembroke from 1785 [Gunther]. Robert Hooke (1635-1703) was a chorister at Christ Church. He was already a skilful mechanic and in 1655, he showed some of his work to Wilkins, who introduced him to Boyle. Boyle employed him as assistant and Hooke built the first air-pump in England, a considerable improvement on previous work. Hooke may have been the actual discoverer of Boyle's Law. Thomas Hyde (1636-1703) came from King's College Cambridge. MA Queen's, 1659; Bodley's Librarian, 1665-1701. Professor of Arabic and Hebrew. In 1694, he published a two volume set, De Ludis Orientalibus, one of the first western expositions of oriental games and their history. Reginald Victor Jones (1911-1997) studied physics at Wadham from 1929, receiving his PhD in 1934. He was then a senior student in astronomy at Balliol until 1936. John Keill (1694-1721) was at Balliol and was the first to teach physics by experiment and the first to exposit Newton at Oxford from 1701 [Gunther]. Nicholas Kratzer (1487- ?, fl. 1523), subject of one of Holbein's fine portraits, entered the new college of Corpus Christi in 1517 as Wolsey Lecturer - the first Oxford Professor of Astronomy. Three of his sundials survive, including one in the garden of Corpus Christi - not to be confused with Charles Turnbull's pillar dial in the quadrangle. [Gunther]; [Gunther] He was later 'deviser of the King's horologies' and he may have designed the astronomical clock at Hampton Court. Donald Michie was a classics scholar at Balliol - his wartime work at Bletchley Park turned him to artificial intelligence. Henry Gwyn Jeffreys Moseley (1887-1915) was at Trinity, in 1906-1910. He then went to Manchester to work with Rutherford, but returned to live with his mother in 1913 and work in the Electrical Laboratory, where he carried out the measurements which established the concept of atomic number in 1913-1914. In 1914, this had attracted such attention that the famous French chemist, Urbain, brought his samples of rare earths to be analysed and Moseley "... untangled in a few days conundrums that had taken chemists six generations merely to propose". There is a commemorative plaque on the family home, now in St Anne's College (thanks to Eddie Mizzi for this information and a photo). The spectrometer that he used to establish the concept of atomic number is in the Museum of the History of Science. His original graph of elements versus his measured values is in the Clarendon Laboratory. William of Ockham was a student of Duns Scotus [Headlam] Legend also associated him with Merton. William Oughtred's Double Horizontal Dial, with part of his Circles of Proportion, the first type of slide rule, was illustrated by Gunther [Gunther] and also [Gunther] and [Gunther] It is now at St John's College library. This is a circular slide rule, but the arms are missing. It is dated 1635 and was presented in 1638 and is the oldest known slide rule. It is currently in the Museum of the History of Science. William Parsons, later third Earl of Rosse, was a student at Magdalen, getting a first in mathematics in 1822 [Moore] and also [Moore]. Rudolf Peierls (? ?-1995) was Professor of Theoretical Physics. Roger Penrose (1931- ) was Rouse Ball Professor in 1973-1996?. FRS, 1972. Wolf Prize (with Stephen Hawking), 1988. Royal Medal. Foreign Associate US NAS, 1998. OM, 2000. See Mathematical Institute and Wadham College for examples of his Penrose Pieces. William Petty (1623 1687) was Vice Principal of Brasenose from 1651 and his rooms, now 106 High Street, were a gathering place in 1652 for the Oxford scientists who became the Royal Society. He taught anatomy at Brasenose, while also being Gresham Professor of Music in 1650-1651. His Political Arithmetic of 1682 was the first statistical work. [Gunther] See also under: Calne, Romsey and Kerry. Baden Powell (1796-1860) (father of the scout, who modified his surname to Baden-Powell) entered Oriel in 1814. Savilian Professor of Geometry in 1827-1860. Bartholomew Price (1818 1898), became a fellow of Pembroke in 1844. A writer on calculus. FRS 1852. Sedleian Professor of Natural Philosophy from 1853 and later Master of Pembroke from 1891 [Gunther]. Portraits in the College and the Bodleian [Poole]. Charles Pritchard (1808-1893) was a notable schoolmaster in London who took up astronomy seriously after his retirement in 1862. In 1870, he was elected Savilian Professor of Astronomy at Oxford. There he initiated and supervised the building of a new observatory, designed by himself and carried out a substantial program of observation and publication over the next 23 years. He was one of the first to recognise the advantages of photography in astronomy and applied it with success to carefully determine the parallax of nearby stars and hence their distance. He devised the wedge photometer. FRS 1840. PRAS 1866-1868. Council of the RS 1885-1887. Awarded MA by decree from New College, Oxford, in 1870 and awarded DD in 1880. Fellow of New College in 1883. RAS Gold Medal, 1886. RS Royal Medal, 1892. Joseph Raphson (or Ralphson) ( -1715?) entered Jesus as a Fellow-Commoner in 1692 and was made MA by Royal Mandate in 1692. He had already published his Analysis aequationum universalis in 1690 which gave his simplification of Newton's iterative method for finding roots of equations. Richard of Wallingford (1292?-1336) was at Merton, c1320 [Gunther]. However, [Henwood] says that Richard joined the Benedictine Order early in his time at Oxford, possibly to thank William, Benedictine Prior at Wallingford who had adopted him when his parents died in 1303 and sponsored his study at Oxford. As a member of an order, he could not study under a secular master and may have been at Gloucester College, a Benedictine house roughly where Worcester College is today. The only survival of this College is that the area is known as Gloucester Green. Henwood says he may have had some connection with Merton. He entered Oxford in 1308 and received his BA in 1314. He then went to join the abbey at St Albans, but returned to Oxford for further study in 1317-1327. He was licensed to lecture, but as a monk, it is unlikely that he was a fellow of any of the secular colleges. [Henwood] suggests that he was director of the Benedictine house. He wrote several works on astronomical instruments and calculation, leading to his being known as the Father of English Trigonometry. His Tractatus Albionis of c1326 describes a complex geared astrolabe with four faces, but no examples are known of it. His Tractatus Horologii Astronomici appeared in 1327 and was the first detailed description of an astronomical clock - he later starting building this at St Albans (qv). He received a second degree, in theology, in 1326?. Stephen Peter Rigaud (1774-1839) was a student at Exeter College from 1791, fellow in 1794, BA in 1797, MA in 1799. Succeeded Hornsby as Reader in Experimental Philosophy in 1810-1839. Savilian Professor of Geometry in 1810-1827. King's Observer at Kew from 1814. Savilian Professor of Astronomy in 1827-1839. He was one of the first mathematical historians, being the first to systematically study the works of Newton, particularly the details concerning the publication of the Principia, and assisting Brewster in his biography of Newton. Brass monument in Exeter College Chapel; silhouette in the Common Room. Leonard James Rogers (1862- ), of the Rogers-Ramanujan identities, was born in Oxford and did a degree in music there [Kanigel]. Laurence Rooke was a Fellow of Wadham, c1650. Earl of Rosse, see William Parsons, above. Bertrand Russell and Alys built a house at Bagley Wood, Lower Copse, in the southern outskirts of Oxford, in 1905 and lived there until 1910 [Eastman]. John Wellesley Russell - see under Balliol College in the Oxford Institutions section. Michael Scot (c1175-c1235) is believed to have studied at Oxford. John Sinclair was at Trinity College. Adam Smith was at Balliol. Henry John Stephen Smith (1826-1883) was a student at Balliol and then succeeded Frederick Temple as Mathematics Lecturer there [Hannabuss]. He was later Savilian Professor of Geometry and a Fellow of Corpus Christi. He was second Curator of the University Museum from 1874 and lived in an adjacent house (qv ubder University Museum). He is commemorated on a plaque in Balliol Chapel. He was buried in St Sepulchre's, in the Jericho area of Oxford, but the original burial records were destroyed in a flood and a 1988 survey and transcription of the legible gravestones did not record our Smith (information from Eddie Mizzi). Frederick Soddy (1877-1956) was at Merton. He became Dr. Lee's Professor of Chemistry in 1919. He was at Oxford when he received the 1921 Nobel Prize for Chemistry for his discovery of isotopes, though this work was done at McGill with Rutherford. Somerville College, founded 1879, is named for Mary Somerville. Rev. Dr. William Archibald Spooner (1844-1930), Warden of New College, was described thus by his biographer: "All his life, Spooner looked like a white-haired baby. He was small, pink-faced and an albino, with a disproportionately large head and very shortsighted pale blue eyes." Arnold Toynbee said "He looked like a rabbit, ...." It is said he was the model for the White Rabbit in Dodgson's Alice's Adventures in Wonderland. William Spottiswoode was a lecturer in mathematics at Balliol. He went into the family printing business but continued as an enthusiastic mathematician, becoming President of the Royal Society. He is commemorated on a plaque in Balliol Chapel. Thomas Strode (1642 1688), an author of mathematical books, was at University College [Gunther]. Frederick Temple (1821-1902), was a mathematical lecturer at Balliol, but went into the Church, becoming Bishop of London in 1885-1896 and Archbishop of Canterbury from 1896. He published a 'proof' of the Four Colour Theorem in 1889 [Biggs]. There is a portrait of him in Balliol's Hall. Alexander Thom, the pioneer archaeo-astronomer, was Professor of Engineering Science at Oxford in the mid 20th century. Edward Charles Titchmarsh (1899-1963) was at Balliol, though his education was interrupted by the first war. Succeeded Hardy as Savilian Professor of Geometry, in 1931. Charles Turnbull, (1579-1581) carved an elaborate pillar sundial, surmounted by a pelican, the symbol of the College, by , in the quadrangle of Corpus Christi [Gunther]; [Gill]. Oswald Veblen exchanged places with Hardy in 1928-1929 [Kanigel]. John Wallis (1616-1703) was Savilian Professor of Mathematics from 1649 to 1703. (Contrary to some reports he was not at Queen's College - that was his namesake, the county historian (1714-93) [DNB]) He was the first President of the Oxford Philosophical Society in 1683. He is buried in the University Church of St Mary the Virgin in the High Street. There is a portrait bust monument on the south wall near the screen. The inscription is fading - I have suggested that perhaps the Mathematical Institute could have it repainted. There is a portrait by Kneller in the Examination Schools. See THIS LINK. Lancelot Lionel Ware (1915-2000), co-founder of Mensa, is commemorated by a plaque outside the lodgings he occupied at the time he and Roland Berrill founded Mensa in 1946 [Dennis]. Seth Ward (1617-1689) was a Fellow of Wadham and Savilian Professor of Astronomy in 1649, later at Trinity, becoming President of Trinity in 1659. He went on to be Bishop of Exeter and of Salisbury. At Wadham, he occupied the room with the oriel window over the College entrance, later occupied by Wren. John Henry Constantine Whitehead (1904-1960) was a student and a Fellow at Balliol in 1933-1946, becoming Waynflete Professor in 1947-1960, which led to his transfer to New College. He was the main founder of the Mathematical Institute. There is a plaque to him in the Antechapel of Balliol. Andrew Wiles (1953- ) was an undergraduate at Merton. Edmond Wingate was at Queen's College to 1614 [Gunther]. Christopher Wren (1632-1723) was a student at Wadham from 1649 (or earlier? ), graduating in 1651 and MA in 1653. He occupied the 'Astronomy Room' - the big room with the oriel window at the top of the tower over the College gate in Wadham, formerly occupied by Ward - so Wren was probably here from 1661 to 1673 and presumably produced many of his plans here. 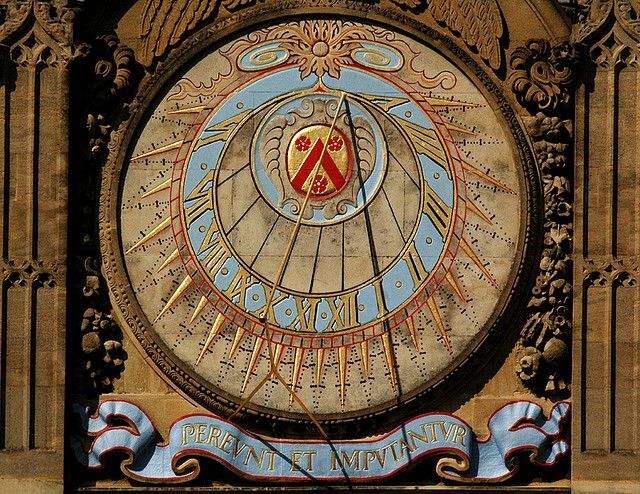 Wadham has a wooden clock face reputedly presented by Wren when he left [Yurdan] above the chapel door [Hobhouse]. While at Wadham, he originated the idea of intravenous injections in 1656 [Summerson] and blood transfusion (in 1657) and he removed the spleen of a puppy, showing that it was not a vital organ [Summerson]. He was a pioneer microscopist and made drawings of the brain for Thomas Willis' Cerebri Anatome of 1664. He also invented a 'diplographic' pen to write in duplicate and designed a bee-hive [Summerson]. Gill says Wren was pleased with its accuracy and quotes him 'one may see to a minute what it is o'clock'. All Souls also has Wren's pre-fire plans for St Paul's (drawn in the Astronomy Room at Wadham), the plans for the Wren Library at Trinity College, Cambridge, the plans for the unbuilt mausoleum for Charles I at Windsor, and his death mask [Summerson]. Evelyn visited him in 1664 and found he had been watching a transit of Venus from the top of the Old Schools Tower [Hobhouse]. There is a bust of Wren in the Codrington Library of All Souls and another in the Ashmolean Museum. There is a portrait and a window in the Hall of All Souls. In 1657, he left to become Gresham Professor in London. In 1661-1673, he was Savilian Professor of Astronomy, but he spent most of a year in Paris during 1665-1666 and I suspect he didn't reside much in Oxford after the Great Fire of London in 1666 and even less after being appointed Surveyor of the King's Works in 1669. In 1662, he devised an apparatus of suspended balls to study impact - Newton's Cradle?? - which Newton explicitly acknowledges as the demonstration of the laws of collision [Summerson]. He also devised instruments for recording the weather and for grinding lenses [Summerson]. Wren also built the north wing of the main or garden quad at Trinity in 1665 (the first Italian style building in Oxford, partially extant, though both the building and the quad have been much changed) and "certainly" made suggestions for the Chapel. He built the top or cupola of Tom Tower at Christ Church in 1681-1682. He may have had some input to the design of Queen's College Library or its front quadrangle, which was done by his pupil Hawksmoor in the 1690s. The Chapel of Queen's was also built by Hawksmoor in 1714, but it is said to be based on a c1682 design by Wren. The Old Ashmolean, now the Museum of the History of Science, has been attributed to Wren, but this is certainly spurious. The nearby buttresses for the Bodleian, in Exeter gardens, are due to his advice [Headlam]. The Chapel and Library of Brasenose College, built in 1656-1666, are also attributed to Wren.